STRONGSVILLE, Ohio — The worst thing that happened to Burrell all day on Monday wasn’t what you’d expect. 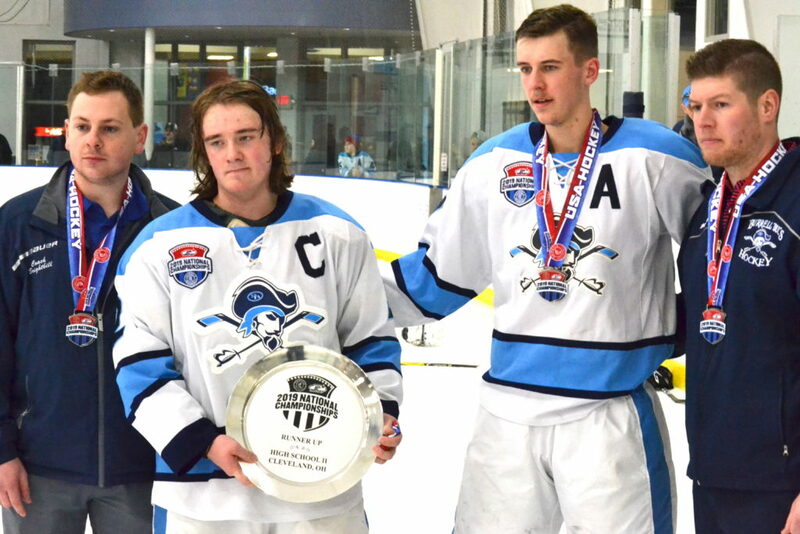 The Buccaneers, facing Monarch (Colo.) in the 2019 USA Hockey High School Division II national championship game, played a pretty even period and a half with the Coyotes, and they were trailing by one goal when the Bucs got a power-play chance a few minutes into the second period. That’s when everything unraveled for the Bucs and their title hopes. Zack Given scored two shorthanded goals within 30 seconds as the Coyotes used a four-goal second period to win, 7-1 and secure the national championship. After Given took advantage of a lackluster Burrell backcheck on the man advantage and a defensive zone turnover by the Bucs, the Burrell players started to show some frustration. A tough call against start forward Tyler Stewart moments later brought things to a head. Stewart landed a light check behind the Coyotes’ net, and was given two minutes for checking from behind and a 10-minute misconduct. Semifinal hero Dylan Zelonka was given a 10-minute misconduct for arguing the call, and then was ejected while continuing to argue from the penalty box. Jadon DelTufo added a power-play goal to make it 5-1 with 4:35 to play in the second period before yet another Burrell player was given a 2 and a 10 for another light check, and coach Max Rickard was assessed a bench minor. Monarch added two more goals in the third period to ice the victory and the championship. Giovanni Palombo scored the lone goal for Burrell on the power play in the second period. Drew Burkett stopped 18 shots in his final game with the Bucs.